Med Ad News spoke with Paul Carter, Gilead’s executive VP, commercial operations, regarding the success of Sovaldi and Harvoni and the company’s vision of the future of biopharmaceuticals. Med Ad News: Your hepatitis C products Sovaldi and Harvoni have rewritten the record books for pharmaceutical launches by several orders of magnitude. Obviously market conditions were ripe for a new hepatitis C option and both products could be clearly differentiated from what came before – but no product could earn $10 billion in its first full year on the market without a successful branding and marketing plan. What do you think were the critical decisions made by the Sovaldi and Harvoni brand teams that helped make both products so successful? Paul Carter: Despite the fact that chronic hepatitis C can be cured, few people with the disease have been diagnosed, linked to care, and successfully treated. Additionally, many diagnosed patients who tried older treatments failed due to low efficacy rates and significant safety issues. The critical decisions made by the company began early on with the design and implementation of the clinical development programs for each therapy. Patients enrolled in our clinical trials better reflected the demographics and type of disease relative to the development programs for older drugs. Robust data from these trials defined the profiles and based on these profiles, we were able to create a number of programs and activities to communicate to patients and healthcare providers the benefits of these new treatments. So really it was the highly differentiated data from the products that underpinned the commercial success. The branding and marketing decisions were very straightforward though we were pleased that we managed to very quickly get alignment across our key markets and thus a consistency of message and strategy. Essentially we managed to execute basic marketing fundamentals very well but thanks to the scientific and clinical development capabilities at Gilead, we had two incredible products to work with. That’s what made the difference. Med Ad News: One of the most impressive parts of the Sovaldi/Harvoni marketing plan was the obvious importance of disease awareness activities. Can you tell us a little about your disease awareness initiatives for hepatitis C – why you chose the strategies and tactics and channels you did, and what worked best? Paul Carter: Most patients diagnosed with chronic hepatitis C have been living with this serious disease for years – and many were told to delay treatment until more effective, tolerable and safer therapies became available. We created a disease awareness campaign to destigmatize hepatitis C and encourage diagnosed patients to rethink their disease given recent scientific advancements. The campaign seeks to communicate that there is new hope and momentum in efforts to cure and eliminate the disease. We chose a variety of multimedia channels because we felt a responsibility to deliver this message of scientific progress and of hope to the millions of people living with the disease. Med Ad News: The revenue from Sovaldi and Harvoni more than doubled your top line in 2014, pushing Gilead from No. 22 to No. 10 among pharma companies worldwide – such a large jump by a company of your size in a single year may be unprecedented in the history of our industry. How has such rapid growth impacted the strategy and day to day operations of the company? Paul Carter: Our mission as an innovative, science-focused company has remained unchanged since our inception in 1987. We continue to be a lean and nimble organization, which allows us to react quickly, make decisions incredibly fast and execute upon them in order to deliver innovative therapies for diseases where we believe we can have the biggest impact. Med Ad News: The success of Sovaldi and Harvoni is retroactively making the acquisition of Pharmasset back in 2011 look like one of the wisest M&A maneuvers the industry has ever seen, though not all of the pundits thought so highly of it at the time. What was it that you saw that others did not? Why were you so willing to take such a risk, paying $11 billion for a company that had no products on the market yet? Paul Carter: We have significant antiviral drug discovery and development expertise that allowed us to evaluate and understand the profile of Pharmasset’s lead compound PSI 7977, now sofosbuvir. We wanted to deliver the best regimen to patients and after seeing the Phase II data, we believed that PSI 7977 was a critical component of any future hepatitis C drug regimen. Med Ad News: The growth of Gilead has tracked with the growth of the biologic compound as a part of the pharmaceutical marketplace – from a small niche in 1987 to dominating the industry today. What do you think is next for biopharmaceuticals? What new targets are still out there that remain to be conquered, and what areas are showing the greatest promise? Paul Carter: Liver disease will continue to be an area of focus for Gilead. There are 400 million people worldwide infected with chronic hepatitis B. For most patients, however, life-long therapy is required. Gilead’s ultimate goal is to offer these patients a cure. In addition to hepatitis B, there are a few companies, including Gilead, investing in nonalcoholic steatohepatitis (NASH). NASH, a common, serious chronic liver disease, could become the most frequent cause of liver transplant by 2025. There is still work to be done in HIV. The availability of HIV therapies has helped avert an estimated 7.8 million AIDS deaths since 2000, transforming HIV infection from an often-fatal disease into a chronic, controllable condition. However, we can still improve upon the long-term safety of regimens, and this is critical as the HIV population ages. We can also do more to enable access for people around the world, including resource limited countries. And, importantly, current therapies can not cure HIV because latent reservoirs of the virus remain in the body, even among people who are virally suppressed. An eradication strategy that involves stimulating the virus production and eliminating latently infected cells is being explored. 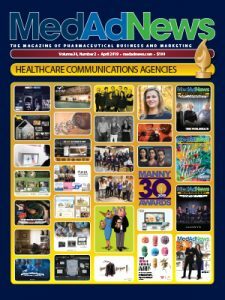 Med Ad News: What do you think have been the most significant changes in the pharma marketing landscape – the ways and means by which companies market and sell their products – over the past five years? What changes do you foresee over the next five years? Paul Carter: Advances in technology have delivered significant opportunities for all aspects of our industry – from research and development to manufacturing and commercialization of products. With respect to marketing, technology is transforming how we communicate with patients, physicians and communities. The mobile web, social networking, and the growing popularity of virtual events and conferences have enabled us to make connections via multiple channels and across broader geographies, meaning we ultimately are able to better understand and respond to the needs of patients. It’s also clear that more patients and healthcare providers use technology to better manage their health and the health of their patients. In the end, marketing for Gilead is about communicating the science in a simple and compelling way. Clever marketing does not and should never compensate for poor science. At Gilead the science always comes first.